This summer, Spiders are traveling around the world for research, internships, or study abroad experiences. While this includes faculty and staff, most are UR students eager to explore the globe and make the most of their Richmond education. The national average of total undergraduate students who study abroad is around 15 percent. At Richmond, that number is around 67 percent. Being a globally minded place has been a big part of Richmond’s fabric for as long as many can remember. The Institute of International Education ranked UR second among United States baccalaureate institutions for the total number of U.S. students sent to study abroad for credit. On campus, we can’t wait to hear about what our students bring back to Richmond from their time studying and researching abroad, especially those who never imagined studying abroad. Alicia Hudalla, ’18, a forward on the women’s basketball team, received a Weinstein Grant to study abroad in Spain. She is a healthcare studies major and biology minor who wants to work in emergency medicine as a physician’s assistant. The diverse populations she’ll serve in emergency healthcare is why she chose Spain, where she became more proficient in Spanish and increased her cultural competency. 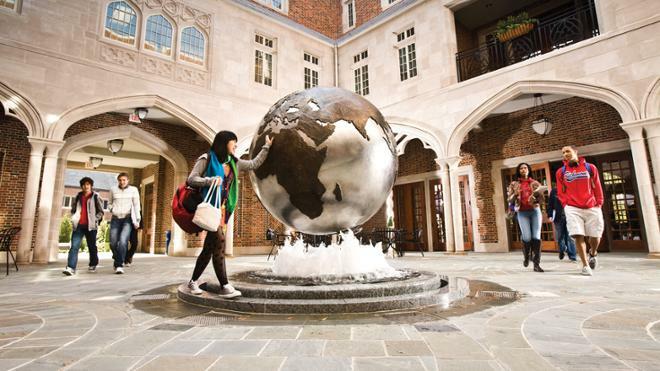 Learn more about international education at Richmond.